When I’m feeling stressed, anxious or tired, it really shows on my skin. I’m sure many of you have felt this way too. Stress and the like can have an impact on your whole body, including your hair and face. For example, I’ve seen my own complexion look lacklustre, dull and grey when I’ve been through a stressful time. My fine lines seem to show more, probably because my skin is often more dehydrated when I’m going through a stressful time or when I’m burning the candle at both ends and I’m more prone to blemishes which I otherwise tend not to get, plus my eyes will often look tired and often have dark circles and puffiness. I’m noticing more and more as I get older that my eyes really show how I feel in myself and that my skin really shows my age and can look even older when I’m not taking care of it and myself. With that in mind, using self care to relieve the signs of stress is really key in helping to make yourself feel better. I’m quite big on self care but I’m really upping the ante on it this year and making more time for me. I’ve got the year off to a great start financially and with work, so that has alleviated a big pressure straight away but my anxiety has been rearing its ugly head on and off since September and most consistently over the last couple of weeks. I think it’s a culmination of a lot of things but feeling unwell since the start of December hasn’t helped as my body has been so rundown and unable to properly rest. I’m stepping up my self care from now on and I’m really making big changes to help me with balancing work and life for good. A big part of this is my evening and morning routine which I’ve been making progress with over the last year but it wavered towards the end of 2018 and I’m determined to get it back on track. I’ll be writing plenty of posts about this as the months go on and sharing what works for me but for today, I thought I’d start with beauty because there are plenty of beauty products and experiences out there to help relieve stress and to help you towards feeling the best version of yourself. When you’re not feeling amazing in yourself be it because of tiredness, stress or anything else, it shows in your whole body so while you’re working on the bigger picture, helping yourself with your beauty routines can help you to feel and look better in yourself. Is your skin feeling tired and lacking that youthful, healthy glow? There are lots of things which could be stressing out your skin but there are some great beauty products that can work overnight to help you to wake up looking more radiant and refreshed the next day. Take advantage of nighttime skincare collections from renowned, high quality brands such as Neal’s Yard, which offer great relaxing, scented products that can be used to help promote sleep and relaxation. Temple balm, pillow spray and lavender scented body lotion can all help to relax you if you’ve been feeling stressed to help to ensure you have a better night’s sleep. While you can’t beat your own bed, and I’m a big advocate of making your bedroom your sleep sanctuary so that it feels like the number one place that you want to relax in, sometimes you just need a night away from home to escape the stresses of day to day life. I recently visited Ramside Hall with my friend as part of my 30th birthday present and it couldn’t have come at a better time. We relaxed in the spa, totally chilled out, enjoyed a delicious meal without having to cook it ourselves and spent even more time in the spa the next day after a tremendous nights sleep. I got some fancy pyjamas for the occasion from River Island which felt all the more special; sometimes you need something a little bit extra simply because you deserve it and these are definitely that for me. 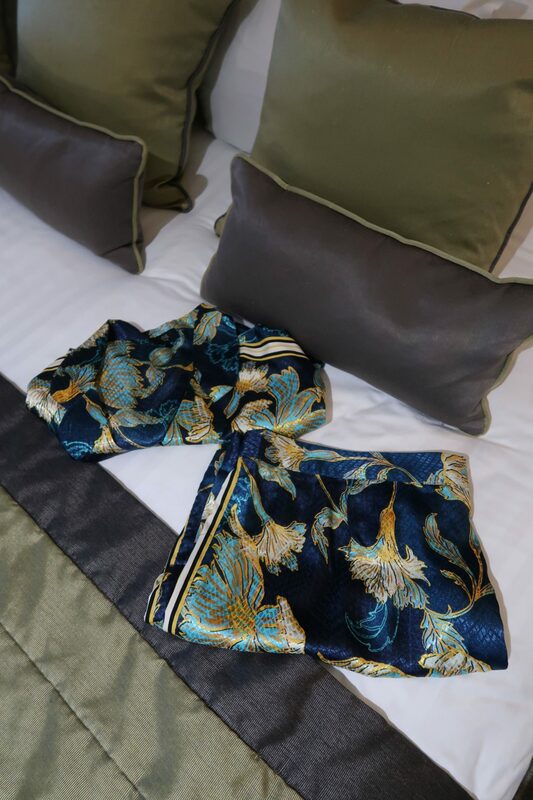 You can find the PJ top which ties at the front and the PJ bottoms, which I’d recommend going up a size or two in as the waistband is quite rigid underneath the elastic but before the main material of the bottoms (if that makes any sense! ), on sale on their website. 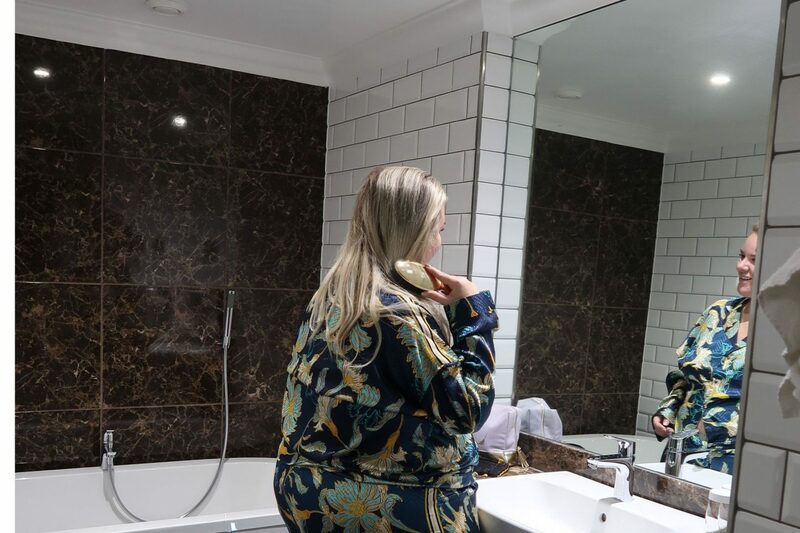 We had a back massage each but the pampering didn’t stop there as we took plenty of beauty products with us from face and hair masks to body scrubs and butters to ensure that we left feeling pampered from head to toe. 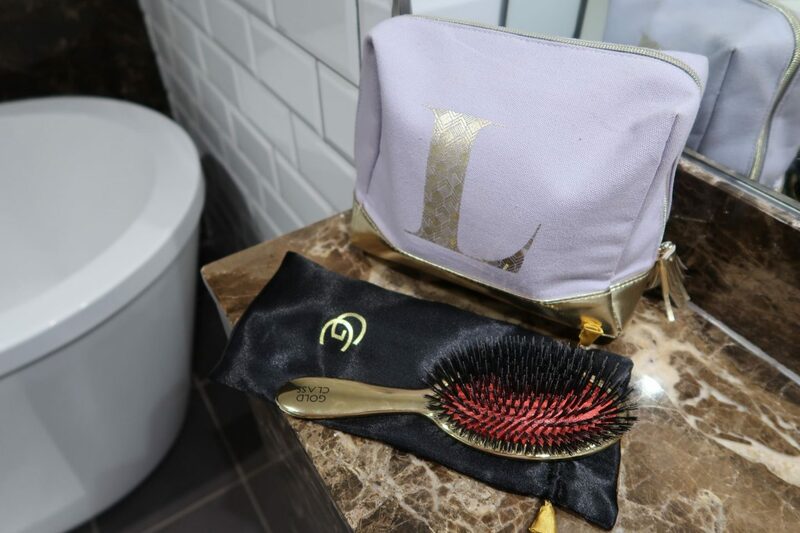 It gave me the opportunity to try out some new products too, including the Gold Class Hairbrush by Inanch, which I knew I would be writing about on my blog so it helped me to still feel productive while I was away. Taking time out to relax in a hot bath with a hair mask on, perhaps reading a book, is a really great way to help to relieve feelings of stress. While I was away I did just that and by the time I was getting ready the next morning to leave, I felt well and truly pampered. I didn’t put any makeup on or really do anything with my hair for the rest of the day because it felt naturally beautiful. This is the medium gold styling brush from Inanch and I’d really recommend it, particularly if you have long hair, regardless of whether you’re wearing bonded hair extensions like I am or if you just have your natural hair flowing freely; it works equally as well on both. You’ll notice the exceptional high quality with these brushes; they’re seamlessly polished and electro-plated to give them a strong, scratch-free finish. This particular paddle brush is made up of mixed bristles secured into rubber padding which enable the brush to glide unrestricted through the hair from right at the root to the tip, even on my long hair. The boar bristles help to evenly distribute the scalp’s natural oils throughout the hair which helps to leave the hair looking healthy and shimmery and the nylon bristles are the ones that plough through the tangles, leaving the hair so soft and knot free. I’ve been using it ever since we went away and I have to say, its worth its weight in gold! I don’t know if its something to do with the silky storage bag that comes with it, but I’ve found that this brush doesn’t make my hair go static either so if that’s something that you struggle with then I’d highly suggest picking one up. There are plenty more brushes on the Inanch website here too. Schedule time for you; be it a weekly pamper hour, an overnight stay or five minutes to apply your relaxing scented body oil and meditate. Regular me time is important and you deserve it. Many women see taking care of their skin as a luxury rather than a necessity; they’re so busy being all things to all people that they forget to pause and take care of themselves. I’ve done it and I’m sure you’ve been guilty of it too at some point. However, developing a good skincare routine is a vital part of self-care. When you take care of yourself, you automatically feel better and more relaxed. Start developing your own self-care rituals and notice how much better your skin starts to look and feel, while your mind becomes much more relaxed. Self-care rituals can be anything from taking indulgent baths to spending half an hour in the evening taking off your makeup, cleansing, toning and moisturising. 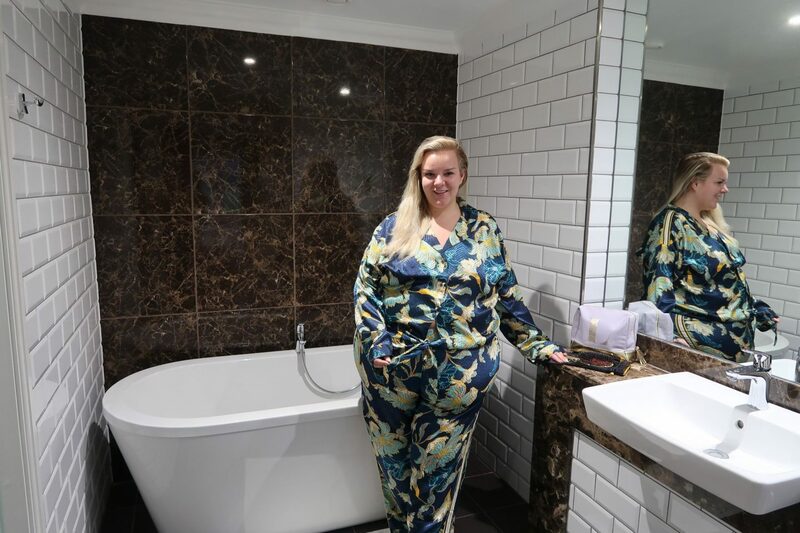 It could even be simply grabbing an extra five minutes in the shower or sitting on the stairs for ten minutes with face mask on, a cuppa beside you and a good book in your hand while your child is doing their homework. Basically, anything which helps you to take care of your mind and your skin can help you to feel much better and more relaxed. Different smells have the power to really alter the mood. So, if you’re looking to become instantly more relaxed, then why not invest in a body mist? The right body mists can leave you feeling instantly de-stressed and many contain ingredients which literally cut right through any tension you may be feeling in your body. Carry them around with you and use them whenever you need a little boost. They’re especially good to use at night, or alternatively you could try a scented body lotion or even a pillow spray. I’ve written about one that really relaxes and calms me in this post. When choosing beauty products to help relieve stress, focusing on ones that use essential oils is a great idea as aromatherapy works wonders on the senses. If you look at more natural products, you’ll see they often incorporate aromatherapy oils such as lavender which is amazing at helping you to feel relaxed and sleepy, citrus which is great for uplifting the senses or rose which is ideal for relaxation, easing stress and fighting anxiety. These oils don’t just help the skin, but they really help to enhance your mood too. Whether you’re looking to feel more awake, or you need a quick de-stress, aromatherapy oils can help. As you can see, self care using beauty products can be a great way to help to relieve feelings of stress in numerous ways, while enhancing the skin and aiding relaxation. A quick face mask or the application of skincare can be a wonderful pick me up but when you get yourself into a routine with it, that’s when the magic really starts to happen and you see the long term benefits. Wellbeing and mental health are matters that I’m really passionate about and its very much the case that one method does not suit all. 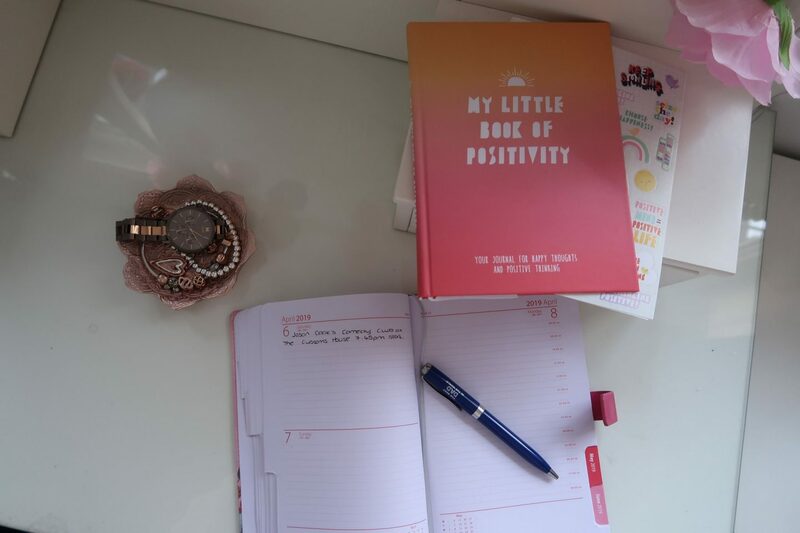 I’ve written a pretty extensive post all about feeling overwhelmed and what to do when it all gets too much that I’d really suggest checking out. It has plenty of practical, realistic steps to take and things to try to help you to get back on track that have worked for me in the past. What beauty products and rituals help you to relieve stress? Omg I love your PJS! Need to invest in a pair of these. Great post. I need to develop my own beauty rituals. What an inspiring post. I need to practice a lot more self care and would love a spa break! Also those pj’s are epic… Off to look for a pair now!